Despite the DRCR Protocol U study, numerous questions still remain regarding the precise role of corticosteroids in the management of diabetic macular edema (DME) — especially in the setting of a patient already receiving anti-vascular endothelial growth factor (VEGF) therapy. I asked Hasenin Al-khersan, MD, and Hani Salehi-Had, MD, to perform the task of analyzing and dissecting the currently available data surrounding the use of dexamethasone and anti-VEGF combination therapy for the treatment of DME. Undoubtedly, good rationale exists for the use of combination therapy given the accepted multifactorial etiology of the pathogenesis of DME. Regardless of such evidence, there are no widely accepted guidelines regarding the combined use of steroids and anti-VEGF in the treatment of DME. What should be the timing of transition from one therapy to another? Does combination therapy impact vision and/or macular thickness? How about treatment burden? Current research in this landscape will be reviewed in this article. The presence of corticosteroids in the arsenal of treatments to manage DME is clearly important. Although much work remains to be done to fully answer questions regarding utility of combination therapy, it is important to understand what the body of research is to date. Drs. Al-khersan and Salehi-Had's insights and review of this complex topic will be highly valued by our community. However, there are currently no widely accepted, evidence-based clinical guidelines regarding the combined use of anti-VEGF and steroid agents in DME. Questions remain regarding the timing of therapeutic transition, selection of agents, and efficacy of combination therapy. Several recent investigations, which will be reviewed here, have begun to examine these issues to determine how to most effectively deploy these treatments. Protocol U of the Diabetic Retinopathy Clinical Research Network study was a phase 2, multicenter investigation of 129 eyes with persistent DME.6 Eyes received at least three anti-VEGF injections before a run-in phase, which consisted of additional monthly 0.3 mg ranibizumab (Lucentis; Genentech, South San Francisco, CA) injections during a period of 12 weeks. Eyes with persistent DME were then randomized either to further ranibizumab and sham treatment or ranibizumab and dexamethasone combination therapy. The investigators found no significant difference between arms in mean BCVA at 24 weeks (mean improvement in BCVA of 2.7 letters in the combination group and 3 letters in the ranibizumab group, P = .73) (Table 1). However, the combination therapy group demonstrated significantly increased macular drying (−110 μm in central subfield thickness [CST] compared with −62 μm in the ranibizumab group; P < .01) (Figure 1). Change in retinal thickness after anti-vascular endothelial growth factor (VEGF) monotherapy and anti-VEGF / dexamethasone combination therapy. * P < .05 for anti-VEGF / dexamethasone combination therapy compared to anti-VEGF monotherapy. There are several questions regarding potential confounding effects with the Protocol U analysis. The investigation initially aimed to only study pseudophakic patients. However, not enough pseudophakic patients could be enrolled, and the study was widened to include phakic patients. Despite this, the study did not have standardized measures for cataract development. Potential confounding effects of cataract formation are particularly interesting given that seven of eight eyes that lost 2 or more lines of vision in the combination group were phakic compared to one of four in the sham group. Furthermore, the fact that macular drying was significantly improved in the combination arm without improvement in BCVA suggests that the addition of the dexamethasone implant may have occurred after photoreceptor death. The time until transition of therapy was long (at least six anti-VEGF injections prior to randomization), and these eyes were not treatment-naïve. Finally, in Protocol U, eyes that were deemed to have persistent DME based on continued foveal thickening despite treatment were included in randomization even if they had been improving during the run-in phase. If more stringent criteria were used prior to randomization in delineating refractory DME, there may have been a bigger difference in the treatment arms. This suggestion is supported by a case-control study by Busch et al. in which eyes refractory to anti-VEGF were defined as having shown 5-letter or less gain or a 20% or less reduction in CST after three monthly anti-VEGF injections. In this study of 110 eyes, at 12 months, eyes that were switched to dexamethasone improved by a mean 6.1 letters, whereas the arm continuing on anti-VEGF therapy lost 0.4 letters (P = .004).7 Thus, the definition of persistent and refractory DME is of great significance in evaluating these results. Other investigations with different protocols investigating the question of combination anti-VEGF and steroid use for DME have found similar results. In a randomized, single-masked, 12-month study of 48 eyes, Maturi et al. evaluated eyes with DME treated with bevacizumab (Avastin; Genentech, South San Francisco, CA) monotherapy versus bevacizumab/dexamethasone combination therapy.8 Once again, this study focused on eyes with persistent DME that were refractory to prior anti-VEGF treatment. Ninety percent of enrolled eyes had previously received anti-VEGF therapy, with 55% having received at least three injections. Combination therapy eyes received intravitreal bevacizumab at baseline and the dexamethasone implant at 1 month. Retreatment with dexamethasone at 5 and 9 months was performed on an as-needed basis (retreatment criteria of CST < 250 μm or BCVA of < 80 ETDRS letters). The monotherapy group received bevacizumab monthly as needed. At 12 months, there was no significant difference in BCVA between the treatment arms (5.4 letters gained in the combination group vs. 4.9 in the monotherapy group; P = .75). Once again, however, there was significantly greater improvement in CST in the combination group (−45 μm compared to −30 μm in the monotherapy group; P = .03). An important subgroup was that of patients with both eyes included in the study. In these 10 patients, the combination group had an improvement in CST of −92 μm, whereas monotherapy eyes improved by only −2 μm (P = .048). A smaller, nonrandomized prospective study from Turkey included 35 patients with chronic DME.9 Patients received a fixed regimen of three injections of 2.5 mg bevacizumab at 6-week intervals. After the third injection, patients were examined every 6 weeks. If central foveal thickness (CFT) was less than 275 μm, injections were held. Anti-VEGF injections were continued if CFT was higher than 275 μm, with a decrease of more than 50 μm in foveal thickness. Dexamethasone implant was done if CFT was more than 275 μm with less than 50 μm decrease in foveal thickness. After the run-in phase of three injections at 18 weeks, among all eyes, there was no statistically significant improvement in BCVA or CFT (P = .45). Of the 35 patients, 15 met criteria for dexamethasone implantation. Among this subset, there was a statistically significant improvement in BCVA at 4 weeks and 12 weeks postoperatively and in CFT postoperatively at 4, 12, and 24 weeks compared to the 18-week baseline. Maximal effects were seen at 1-month post-dexamethasone treatment, with a decrease of 183 μm in CFT and an improvement in BCVA of 0.26 logMAR. However, the mean BCVA (P < .001) and CFT (P = .01) had both significantly worsened at 24 weeks postoperatively compared to 12 weeks postoperatively. Although this study was limited by a small sample size and lack of randomization, it demonstrated an initial improvement in BCVA after dexamethasone treatment. This is significant given that the eyes included had chronic refractory DME (defined as CFT > 275 μm for > 6 months) and are the most difficult to treat in the real-world clinical setting. The improvements in BCVA and CFT were most pronounced at 1 and 3 months and faded by the end of the 24-week postoperative follow-up. These findings are not unexpected, given the duration of the intravitreal dexamethasone implant. Although the investigations reviewed here consisted of different study designs, treatment criteria, and patient populations, some common themes emerged. Firstly, the studies consistently demonstrated that the addition of corticosteroid therapy led to statistically significant improvements in macular drying. 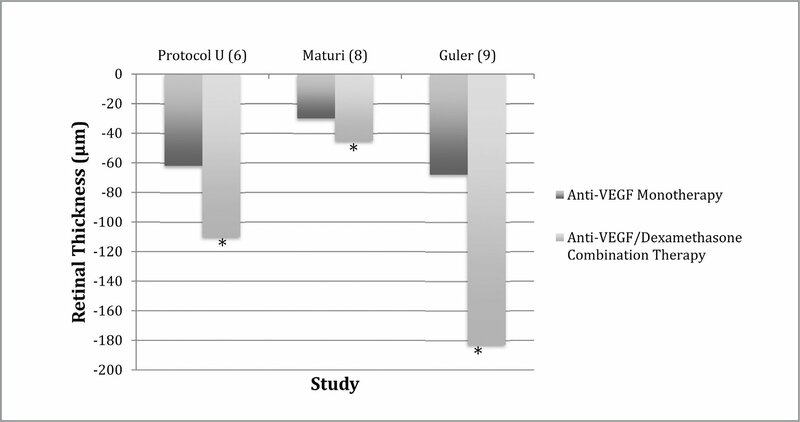 However, the macular drying was not always accompanied by improvement in BCVA. Given that these studies examined eyes with persistent DME, this finding may suggest that the addition of the corticosteroid may have occurred after photoreceptor death had already transpired. Further prospective investigations into the combined use of steroid and anti-VEGF therapy should include earlier transitions of therapy. In analysis of the Protocol I data, Gonzalez et al. demonstrated that 3-month BCVA response to anti-VEGF therapy correlated significantly with BCVA at 1 and 3 years' follow-up.10 The retrospective trial by Busch et al. transitioned therapy after three monthly anti-VEGF injections and found a statistically significant improvement in vision if eyes were switched to dexamethasone at this stage compared to continued anti-VEGF therapy.7 In a study by Todorich et al. 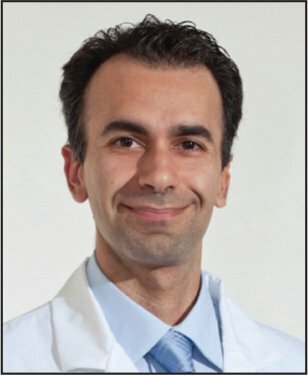 evaluating simultaneous dexamethasone implant therapy and anti-VEGF therapy in neovascular age-related macular degeneration (nAMD), patients who had improvement in BCVA with combination treatment had had a lower mean number of prior anti-VEGF injections (21.0 vs. 28.9).11 Although the study was evaluating nAMD, these results support the possibility that earlier addition of corticosteroids in refractory eyes may lead to better visual outcomes. Lastly, in a multicenter retrospective study evaluating the treatment of totally therapy-naïve versus refractory eyes with DME with the dexamethasone implant, the naïve group demonstrated a statistically significantly greater improvement in vision compared to the refractory group at 24 months (11.3 vs. 7.3 letters, respectively; P = .01).12 These findings together suggest that earlier initiation of dexamethasone treatment is needed to achieve maximal outcomes. Ultimately, the introduction of intravitreal steroids represents an exciting additional therapeutic tool in the arsenal against DME. Yet many questions remain regarding their use in conjunction with anti-VEGF agents. While the studies reviewed here have begun to answer questions regarding the efficacy of these combinations, much work remains to be done in determining the appropriate combinations of agents, the timing of therapeutic transition, and the outcomes of such protocols. The answers to these questions will lead to better outcomes for patients with DME. Shah SM, Nguyen QD, Sy JP, Lanchulev T. The RIDE and RISE studies of the efficacy and safety of intravitreal ranibizumab (LUCENTIS®) in clinically significant macular edema with center involvement secondary to diabetes mellitus. Invest Ophthalmol Vis Sci. 2008;49(13):1562. Hariprasad SM. Current approaches to the management of diabetic macular edema. Am J Manag Care. 2016;22(10 Suppl):s292–s299. Hasenin Al-khersan, MD, can be reached at 1323 W 18th Pl., Chicago, IL 60608; haseninrh@gmail.com. 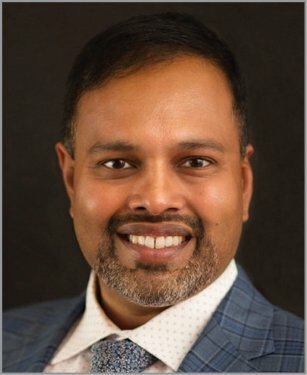 Seenu M. Hariprasad, MD, can be reached at the Department of Ophthalmology and Visual Science, University of Chicago, 5841 S. Maryland Avenue, MC2114, Chicago, IL 60637; email: retina@uchicago.edu. 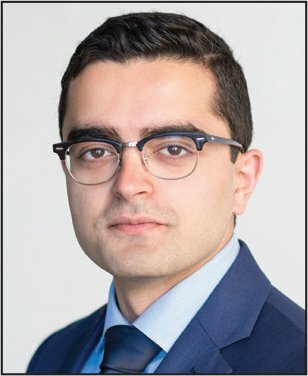 Hani Salehi-Had, MD, can be reached at Atlantis Eyecare, 7677 Center Ave., Suite 301, Huntington Beach, CA 92647; email: hanisalehi@yahoo.com. Disclosures: Dr. Al-khersan reports no relevant financial disclosures. Dr. Hariprasad is a consultant or on the speakers bureau for Alcon, Allergan, Novartis, OD-OS, Clearside Biomedical, EyePoint, Alimera Sciences, Spark, and Regeneron. Dr. Salehi-Had is a consultant for Allergan outside the submitted work.